Edith I. Wilson, 101, Holton, died Wednesday, Jan. 21, 2015, at Medicalodges Jackson County nursing home in Holton. She was born Dec. 20, 1913, at Blaine, the daughter of Jesse and Nellie Hamilton Thornton. Her family moved to Soldier when she was very young. She was raised at Soldier and moved to Holton in 1942. She has lived at that home ever since. Edith married Wilmer “Hack” Wilson. They were divorced. In 1948 she and Hack started a trash service, and in the early 1950s they ran a laundromat together. She also helped him with several tavern businesses, worked at the Gilkerson Potato Chip Factory and for 39 years did free-style quilting from her home. Edith ran for city commissioner in the 1980s and volunteered at the Jackson County Training Center in the 1990s. She loved gardening and raised a lot of African Violets. 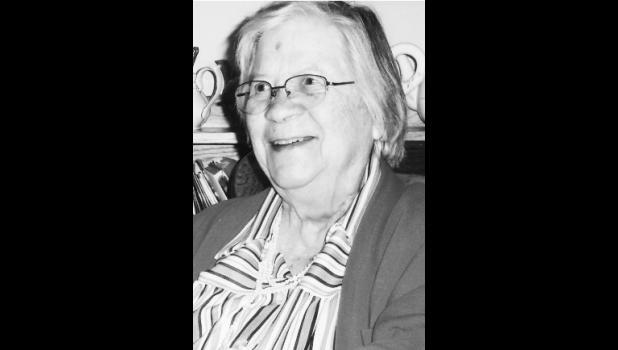 She was preceded in death by a son, Wilbur Wilson and his wife Cathy; a son-in-law, Jerry Horr; a brother, Charles Thornton and his wife Luella; a half-brother, Jess Thornton; a half-sister, Pearl Pool; a granddaughter, Terry Stew­art; and three great-grandchildren.. Survivors include a son, Willy Wilson and wife Dianna, Holton; two daughters, Anita Eby and hus­band, Gene, Mayetta, and Rowena Horr, Topeka; a childhood friend, June Houck, Princeton, Mo. ; 25 grandchildren; 55 great-grandchil­dren; and 25 great-great-grandchil­dren. Cremation is planned. Graveside services will be held at 11 a.m. Wednesday, Jan. 28 in Soldier Cemetery.